Previous review of F120/RP301 - January 2, 2014 - I semi recommend the Roland RP120 ($1299US internet discount price) or RP301 ($1699US internet discount price). What I mean by "semi recommend" is that I do not fully recommend these models because of a few basic deficiencies which I discuss below. 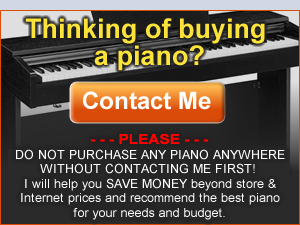 I do like some higher priced Roland pianos very much (the Roland HP series and others) and have used them personally for years and Roland is a great company. 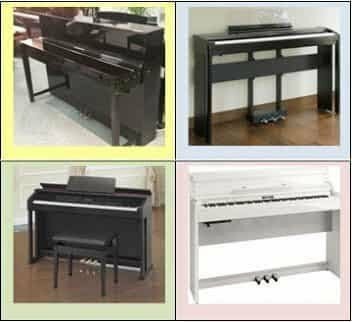 The Roland RP301 & F120 are the identical pianos in every way except for cabinet design, control panel/button placement and weight, and are the lowest priced Roland cabinet pianos in their home digital piano line-up for 2012/2013. 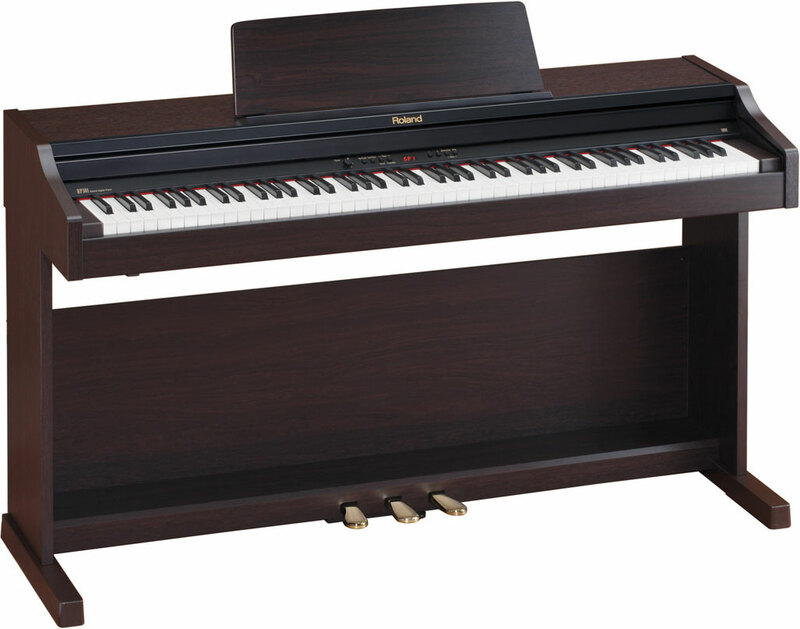 There are many cool features on both models including "twin piano" which electronically divides the 88-key piano keyboard into two identical 44-key keyboards so you can play duets with two players simultaneously, & 30 very nice individual and layered instrument sounds on these two models. 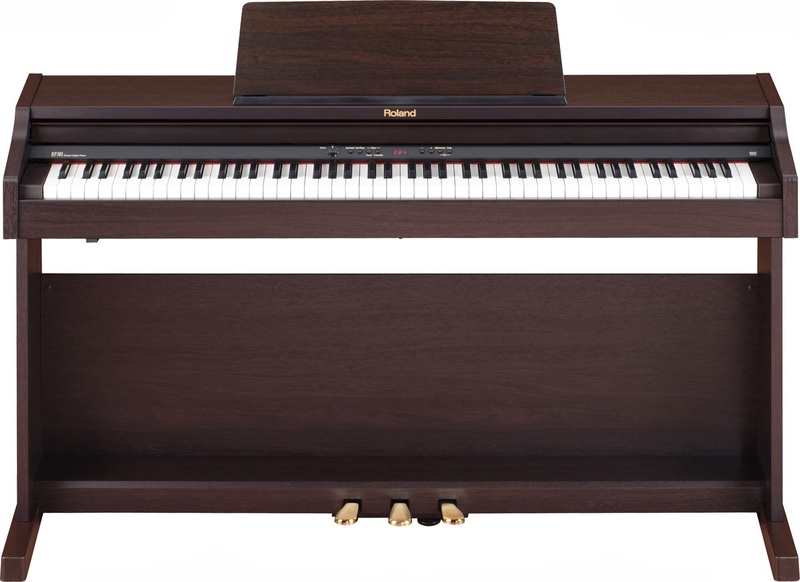 The RP301 is offered in an attractive satin brown rosewood and satin black furniture style cabinet with sliding key covers and comes with a matching bench. The F120 is offered in a black or white cabinet with a folding key cover. Although Roland is still using a smaller 24 watt, two speakers sound system in both pianos, this is enough power for pretty good volume but unfortunately for some reason the sound is a bit thin and tinny when you play the middle part of the keyboard (where most people play). The sound is actually much better through a good pair of headphones, although Roland's SuperNATURAL piano sound is not so "supernatural" in the middle octaves of the keyboard even through headphones, and it sounds unnatural to me. The lower bassier piano sounds are full and resonate, but as you get up to the middle and upper octaves, that's where the piano starts sounding somewhat electronic and thin. A first time player or someone who doesn't know what pianos are supposed to sound like may not notice this unnatural part of the piano sound when playing in middle and upper octaves, and so it may not be an issue for some people, but it is for me and that's why I am pointing it out. The dynamics and expression response on these pianos however is very good and much better than many other digital pianos, and that a big plus. I was looking forward to seeing what new type of key action Roland would be using in these new models and Roland chose to use their Ivory Feel-G Keyboard Action found in a couple other Roland models including the FP4F and RD300NX. 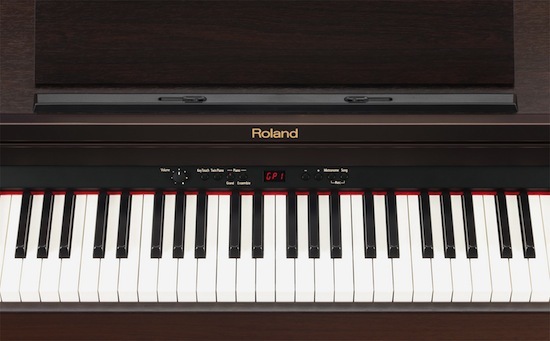 Roland's goal was obviously to improve the key action and piano sound from the previous models, and in some ways they did a good job and in other ways they went backwards, in my opinion.The new key action is supposed to be heavier and closer to that of a real acoustic piano, and it is, as far as being heavier. Roland did improve that part although the key movement is sluggish when playing softly or lightly as well as on flats & sharps (the black keys) where your fingers play nearer to the top of the keys. 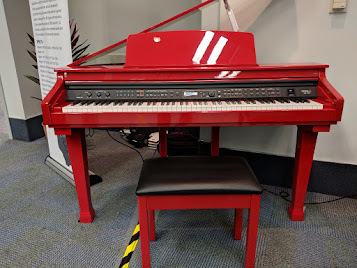 The upgraded Roland key actions in the higher priced HP models including the portable FP80 move noticeably better and more smoothly, but those pianos are $2000 and up. Roland also claims to have added an "escapement" feature in the key action which is supposed to give the feeling of playing on grand piano keys as opposed to playing an upright piano. Unfortunately, this "escapement" feature is virtually non existent in the G-Keyboard as opposed to the escapement feature in the Roland PHA series of key actions found in the majority of Roland pianos. You just cannot feel it (I could not and I know what it should do), no matter how hard or softly you press the keys. Roland might as well as have not mentioned this on their specs because it just doesn't work based on my playing experience with them. This is not the case with the better Roland key actions as you can definitely feel this feature on those pianos and it's quite good. Finally, with regard to key movement noise, Roland has also has a noticeable problem with a few of their models with the ivory-feel G action making a loud thunking/thumping sound when the keys are played harder when trying to achieve louder volume or being played with some force on more aggressive music. The Roland HP302 digital piano at about $2500 had this issue (that model is discontinued) and I have played many of them and they all did the same thing. Unfortunately it is no different on the RP301 and F120. So in an effort to improve the weight and resistance of the keys, it would appear that Roland did not get rid of the distracting key thunking noise, and that's too bad. The loud noise when playing the keys sounds like there isn't enough felt under the keys to prevent the keys from knocking on the keybed underneath the keys. I don't know what causes it exactly, but when you play at lower volumes or use headphones for private practice, the thumping sound from the keys is quite disturbing and distracting when pressing the keys harder, and I have had owners of Roland pianos with this issue tell me this themselves. However, if you play the keys lightly or softly on these two models, you really don't hear the thumping noise because you're not playing the keys hard enough. But that's not the way people play because you use dynamics and different expression and you will likely run into this situation, and there's nothing that can be done about it. I would have expected this issue in an off brand, but not in a Roland, especially in the $1000+ price range. 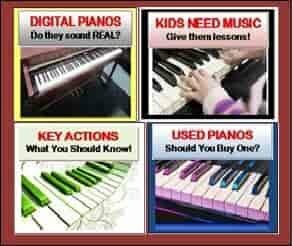 Piano key actions and the way they move, look, and feel are very important and people need to consider that before they make a digital piano purchase decision. Although all digital piano key actions on all brands produce some background noise when being played, there are some digital pianos that have obvious distracting noise that are just not acceptable to me, and the RP301 & F120 are two of those pianos, although there are a number of off-brand pianos that do similar things. 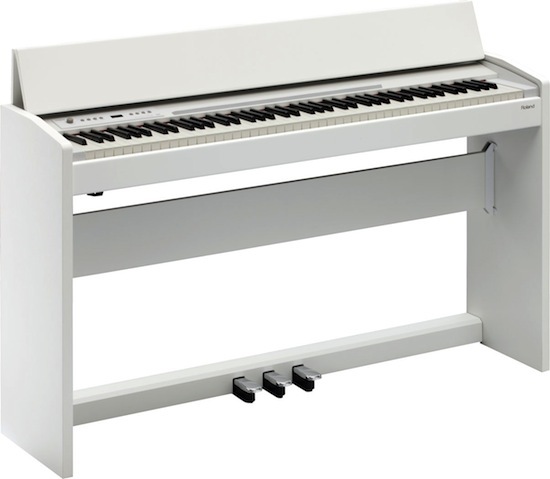 On the plus side, the Roland RP301/F120 models do have good pedal sustain and decay time, useful front panel dedicated control buttons, a nice LED display information window, a handy sliding key cover on the RP301 and folding cover on the F120, 128 notes of polyphony memory which is good, an adjustable electronic metronome for timing, an overall nice acoustic piano sound (Roland calls it SuperNATURAL sound) but not as good as it should be, an 1/8" mini jack audio input to run an iPod/MP3 player through to play along with (very cool), a song recorder, reverb effects, 5 levels of touch sensitivity control, built-in music holder clips in the music rack (above left pic on the RP301), and half-damper sustain pedal for more authentic pedal expression (which is good). 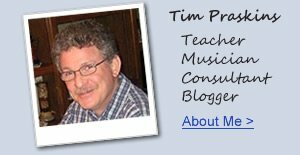 If you want more piano info and LOWER PRICES than internet discounts or store prices, please email me at tim@azpianowholesale.com or call direct at 602-571-1864. What do you recommend instead of F120 then? I have to say that I've been running into this annoying key thump from a yamaha cp33. I can still return it and I'm willing to spend about $2000...what should I try. I completely understand how that thump ruins the joy of just playing and enjoying the keys! I've noticed the thumping keys on EVERY digital piano I've played. What can you say about Kawai cl 36,as an expert you are,what can you say me about this piano?Is it good for a child of 7 years who wants begin to study to play or could you recommend me something with some good price.Thanks. Would you recommend the older F110 model over the F120 then? 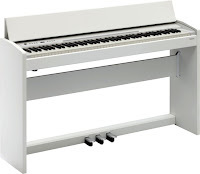 I'd like to buy a Roland, with the possibility of paying a little more wich model would you recommend? I'd like to buy a Roland, there's a better model would you recommend me? I'm professional pianist. In my country (Brasil) RP 301 R it´s too expensive ~$2,000. I'm looking at a Roland HP 2000 which is on ebay. It's only for my 7yr old but I have been advised to get something with weighted keys. Might this be a reasonable (cheap) option?